Touch the All Apps button on the Home screen. Long-press the app icon that you want to add to the Home screen. After a moment, you see a Home screen panel preview displayed. Drag the app to a position on one of the Home screen panels. Position the app where you want it to go and lift your finger. 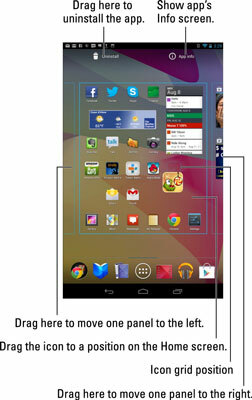 An outline appears on the Home screen panel preview, showing you where you the icon goes when you lift your finger. Any other icons that are in the way are shuffled around to make room for the new one. The app hasn’t moved: What you see is a copy. You can still find the app on the All Apps screen, but now the app is — more conveniently — available on the Home screen. Everything on the Home screen is movable. If you don’t want an app or widget on the main Home screen panel, move it. If you don’t want the app on the Home screen, drop it there anyway, and then remove it. Keep your favorite apps, those you use most often, on the Home screen. Icons on the Home screen are aligned to a grid. You can’t stuff more icons on the Home screen than will fit in the grid, so when a Home screen is full of icons (or widgets), use another Home screen panel.